Are you an RC pursuing a career in VC? The Rock Venture Partners program enables a small group of HBS students to learn more about investing in startups by supporting Rock Accelerator teams as they go through the process of pitching and starting a venture. The program is run by Jeff Bussgang HBS Senior Lecturer and Flybridge General Partner. Evaluate and Invest: Evaluate and Invest: As part of the investment committee for the Rock Accelerator program, Rock Venture Partners will learn to evaluate teams and allocate a limited set of funds across a myriad of business proposals. Advise: By sitting on the boards of Rock Accelerator companies, Rock Venture Partners will begin to understand the complexities of building a business and how a VC's role can help a company succeed. Get Access: As members of the Rock Accelerator investment committee and via a widely circulated resume book, students will gain unprecedented access to managing partners at some of the top firms in the U.S. and gain insight into their thinking, philosophy, and upcoming needs. 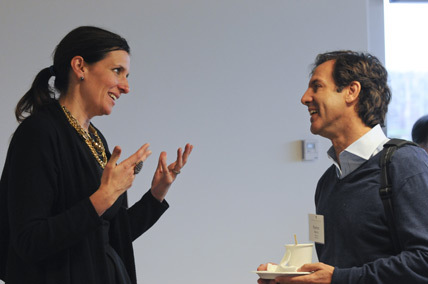 Network: Attend meet and greets with prominent VCs around the U.S. through dinners, coffees, or Skype sessions to gain further perspective on being a VC as well as build your VC network connections. Students meet together regularly to discuss their VC projects, the latest industry trends, and VC news. Shadow a VC Firm: Get matched with a VC firm based on your interests. Complete a project or deep dive on a sector of interest for the firm and potentially sit in on company pitches and partner meetings. To be eligible for the RVP program students must be rising ECs with an interest in supporting the Rock Accelerator teams and be pursuing a career in VC . We also look for candidates who have experience in startups, venture investing, or product management; the desire to learn from experienced investors; and the ability to commit to key dates, deliverables, and role requirements for the academic year. Accepted students can also decide to apply for IP credit with Professor Bussgang. Attend the Information Session on tuesday, March 5, 2019. We will also start accepting the applications for the pogram from this date. View information session presentation here. Submit your application before the Application Deadline: Friday, March 15, 2019, at 12 noon by emailing it to Rock@HBS.edu w/ the subject line: RVP Application 2019-20: (Your Name). Be sure to include your resume and put your first and last name along with your email in the header of each page. Save the Date: April 17, 2019 5:30-8pm to attend Rock Pitch Day, if selected. Alex Thinath is interested in early-stage venture, primarily focused on the enterprise. Before HBS, Alex brings a broad background in fintech/financial services, enterprise tech, and experience as a founder of a seed-funded healthcare startup which he launched as CTO while pursuing a Chemical Engineering degree at the University of Michigan. Ellen Le comes from startupland, working in product as the first employee at Pinrose (fragrance ecommerce) and as the solo marketer at Accompany (business intelligence) before joining Google. She studied Chemical Engineering at Stanford, and spent last summer in early stage venture at Javelin Venture Partners. She’s most excited about companies focused on consumer apps, marketplaces, AR/VR, and the future of social. Paul Jun is a Rock Venture Partner and has spent the last two summers with Index Ventures in San Francisco, focused on late-stage VC software investments. Paul spent the prior four years at Dropbox, serving as VP Corporate Finance & Strategy. He started his career in New York as an investment banking analyst at Morgan Stanley and in Los Angeles a private equity associate at Leonard Green and Partners. Before business school, Maura Lynch was a product manager and data scientist focused on recommendations at Pinterest and PocketGems. She’s interested in enterprise applications that support small businesses and consumer companies in the food and health space. Madeline Keulen focuses on consumer and tech investments, having gained experience in early stage venture with G51 and Victress Capital. Prior to HBS, Madeline worked in management consulting, leading transformational change for consumer-facing businesses, including projects in growth strategy, operations, pricing, post-merger integration, and due diligence. Prior to HBS, Shravan Narayen worked in engineering and product at two startups, C3 IOT and Quantifind, both of which brought Machine Learning capabilities to new industries. He’s interested in startups that are digitizing manual workflows, transforming legacy industries, and promoting health and wellness. Alexander Vidiborskiy is quantum physicist by training, but his pre-HBS experience is mostly in tech startups and VCs. His most recent experience was at Atomico, $1.7m AUM VC fund managed by former founder and CEO of Skype. He is passionate about real-world applications of AI/ML, frontier tech and new platforms. Aahan Bhojani is an second-year MBA student. Prior to HBS, he was a strategy consultant at Bain and has worked as a policy advisor to the UAE government. Aahan is passionate about early stage investing in consumer-technology and F&B businesses. Prior to HBS,Colin Rogister served in the National Economic Council as a member of the technology team in President Obama’s White House. This past summer, he was an investor at Fusion Fund, an early stage VC in Palo Alto. His investment interests include ed tech, AI/machine learning applications, industrial IOT, and consumer/home tech for the aging population. Melissa Zoerb is interested in early-stage consumer VC. Before HBS, Melissa’s background has been primarily in retail strategy, starting at Target and most recently leading digital innovation at Hudson’s Bay Company (Saks Fifth Avenue, Gilt, Lord and Taylor, Hudson’s Bay). She brings experience working with entrepreneurs, having stepped in as Interim President at her family business before HBS, and launching new product expansion this summer at a DTC healthcare startup. Are you on Twitter or Instagram? If so, we'd love to see what you're up to throughout New Venture Competition. Add the hashtag #HBSNVC to all of your NVC related tweets & photos! A year long entrepreneurial journey that culminates with a capstone event for students who have worked to develop new ventures while at HBS. All participants present live to top investors and entrepreneurs and receive invaluable feedback at each round of the Competition. $150,000 in cash plus in-kind prizes! This innovative, immersive, and competitive yearlong program supports 10-15 teams with up to $7,500 in seed capital, matched mentors, and facilitated peer exchange as they race to Demo Day where teams pitch their ventures to investors and entrepreneurs. Rock Center support for entrepreneurs extends far beyond graduation. The Rock 100 initiative brings together high impact alumni entrepreneurs with early-stage traction to connect, learn, and share their ideas and experiences. Join the network to participate in our global Entrepreneurs' Summit, regional Roundtables, and smaller forum groups (Rock Councils). Visit our Showcase to see the HBS entrepreneurs who are currently members of our Rock 100 community. Rock Summer Fellows enables students to continue to explore their entrepreneurial path, both as founders and as those interested in joining early-stage startups, through a 10-week summer fellowship that provides not only financial support but a peer network and community for students.